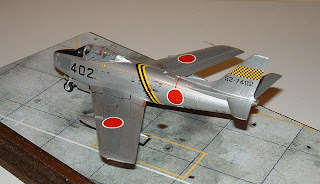 It is very nice to be able to post some more pics of another Japanese aircraft from the era after WWII. Julien Dixon kindly provided these images of a Sabre F-86 F-30 in the markings of 1st Sqn JASDF at Hamamatsu AB in 1956 and very effectively displayed on a concrete ramp base. The model is built from the Hobby Boss 1/72nd kit, straight from the box, and with decals taken from the Fujimi kit. Japanese Sabre squadrons displayed a plethora of colourful markings and make very good modelling subjects. They were flown by several pilots who had air time in the earlier Japanese fighters of the wartime years, both Army and Navy, including a few aces. 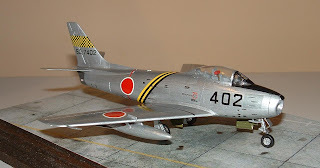 The Sabre was Japan's first post-war fighter type beginning with the delivery of 29 ex-USAF F-86F-25 and -30 aircraft from December 1955. The first JASDF Wing was activated on 1st October 1956 at Hamamatsu with 68 T-33A trainers and 20 F-86Fs. A total of 135 ex-USAF F-86Fs were eventually delivered between 1956 and early 1957. Most of these aircraft were Korean War veterans which were gradually brought up to F-86 F-40 standard. Some of the Sabres were never flown and were returned because of a shortage of Japanese pilots. Mitsubushi subsequently built another 300 Sabre F-86 F-40 under licence at Nagoya with the first being completed on 9th August 1956 and the last rolled out on 25th February 1961. The last Japanese F-86F made its final flight on 15th March, 1982. With its 27-years of service the Sabre enjoyed greater longevity than any of the Japanese wartime types. Further to the blog about Humbrol Authentics Japanese Air Force paints, George Crozier has very kindly provided an image of his 1/72nd A6M2-N "Rufe", made in 2002 from the Jo-Han kit and painted with a 30 year old tin of Humbrol's HJ4 N.9 Mauve from the set which he purchased in 1972! George added aftermarket cockpit details and a Hasegawa beaching trolley. Wonderful! Any other purple Rufes out there? I'd be tickled - er - purple to show them here! Thanks to Julien and George for kindly contributing these images. Thank you for posting, fine effort on these two subjects. The Rufe does bring back memories of the early 1970's! 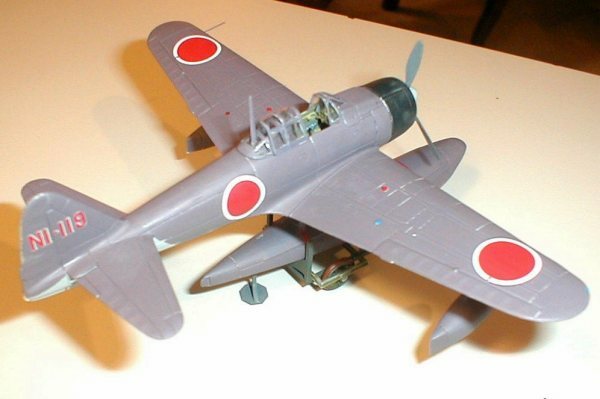 Has Japanese Mauve (in Airfix interpretation) anything to do with British PR Mauve?